Since we're in the D.C. area and got the day off anyways, we figured we sure head on down to the Mall to watch the Inauguration ceremony. No, we didn't have any of the tickets to get access to the better viewing locations, but it would feel more like we were watching it in person if we were toughing out the cold with two kids in a mass of people rather than taking the easy road and watching it live in HD on our TV at home. 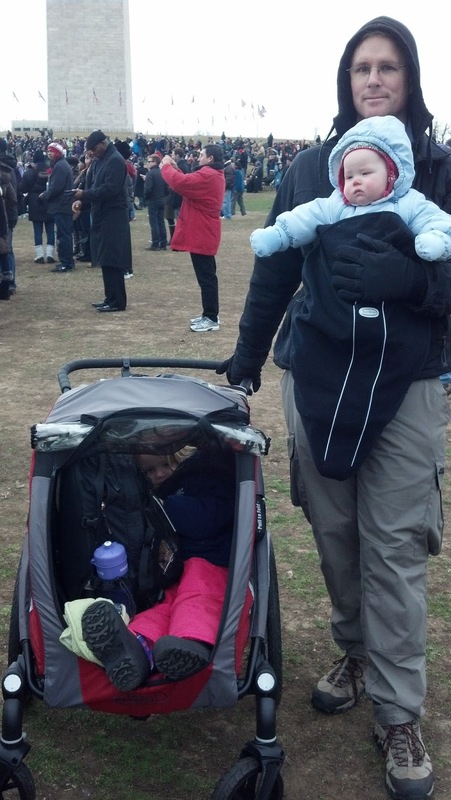 Fortunately, we had received the Baby Jogger POD for Christmas, and we were took it to the inauguration for an inaugural run. Since it can carry two kids and plenty of supplies, it's like a little urban assault vehicle. Because the Metro access was limited, it was most practical for us to walk from Arlington Cemetery across the bridge to the Lincoln Memorial. And even though it was MLK day, we had to pass on visiting that monument because it was on the south side of the mall and we were headed north. By the time we got to the Washington Monument, the eastern portion of the Mall was already at capacity so we ended up watching it on a big screen TV the size of a truck trailer. Which was all well and good until the audio & video started messing up. Believe me when I say that "Battle Hymn of the Republic" sounded like cats wailing, because everything was out of sync. After that, we walked around the parade route, then down to where we watched the parade. A lady next to me had her camera on a monopod and was holding it up over the fence, which seemed like a pretty clever idea...until the police came over to ask her to put it down. Apparently, she was spotted by guy in tower and he was watching the whole thing play out through his high-power binoculars. I did get to see the back of President Obama during the brief period where he got out of the car and walked along the parade route. So, yeah, you can see how security might freak out a little bit more. We stopped at a new place called the White Apron for dinner. They had Pelligrino sodas, complementary still & sparkling water. I told our older daughter that the soda machine was out of soda and the sparkling water was all it had left. The staff at White Apron also gave her a delicious caramel for dessert. After dinner, we found our way to the metro and the easy ride home. So glad we didn't have to drive through DC on inauguration day, as the city was still mostly shut down before we got home. I spent the last week in a class called "Basic Leadership Skills" at the Foreign Service Institute. Normally, the class schedule starts a few hours after the normal work day and ends a little bit before it. Well, with all the stuff I had going on trying to catch on things after the holidays and my quick trip to Copenhagen, that schedule didn't happen. I ended up going into work early, then going to class, then going back to the office for a couple of hours. Home life consisted of making dinner and going to bed, but I approached the week as an endurance sporting event to keep my energy levels up. And it also gave my time-management skills a workout. Anyways, this leadership class delved deeper into the Myers-Briggs (MBTI) types and relationships than any other class or assessment that I'd had before. I'm an ISTJ...but with only slight preferences that way. Perhaps the best take-away from that part of the class was that "If a 'J' is sitting around doing nothing, it's because he's sheduled himself to do nothing at that time." Two other acronyms that I liked were: HARD and WAIT. Communication should be "Honest, Appropriate, Respectful, and Direct." Couple that with "Why Am I Talking?" and you get a sense of what the course was about. What made this different from & better than all the military leadership courses that I'd had in a past life was that this was not focused on military leadership and not taught by military instructors to a military audience. At my table were folks from the Office to Monitor and Combat Trafficking in Persons and also some from the Bureau of International Narcotics and Law Enforcement Affairs (better known as "Drugs & Thugs"). So, yeah, knowing how to use soft skills and interpersonal relationships are important. To kick off the new year, I got to take my official first trip using my diplomatic passport. It was somewhat short-notice, as I started the trip approval process just as the holidays were kicking off. And while while I've been to Denmark a couple of times, I still found myself researching some things up until the last minute. 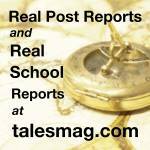 With all the chaos of the holidays, it soon became apparent that I hadn't thought everything through, given the fact that I actually knew what to expect. While getting authorization for my trip, I forgot to identify that I was going to use my government travel card at an ATM. So rather than misuse the GTC, or withdraw cash from my personal bank account and pay the conversion fees, I figured that it's a short enough trip that I can probably go cashless and survive on credit cards alone. I should have known better, as I'd found myself in this exact position in Denmark before. When I'd visited Legoland in Billund many years ago, one of the most stifling realities was that a majority of places in Denmark that take credit cards require them to have a EMV chip/pin. It cuts down on credit card fraud, and for those of us with credit cards installed without a chip...it cuts down on the ability to purchase things like, say, food, gas, and public transportation. I was reminded of this as I tried to buy a metro pass at the airport. While they do take credit cards, those accepted cards must have the chip or they won't work. Fortunately, US currency is also accepted at the airport metro station and change is given in Danish kroner. So, at least I have $5 in Danish coins along with my metro card. After leaving the metro, the first thing my rolling luggage brought to my attention was the cobblestone sidewalks and the sandy grit that typically fills in between the stones. Unless it's just rained, in which case the grit works its way out of the cracks and into the wheels of my baggage. To be fair, the Danes are really practical and installed large strips of stone that cut through the cobblestones and make for a much smoother experience. Even so, my bag's wheels were intermittently jamming, causing it to slip and slide on the smooth, wet stone strips. Arriving at my hotel, I was somewhat proud of myself for having remembered to pack the two-prong plug converter so that I could charge my computer and phone. I even remembered that the sockets often have a switch right on them, so that you can turn off the power to the individual socket. Feeling like I had a good handle on things, I headed out for my meeting. What I'd forgotten was that there is common feature in European hotels: the keyed light switch. When you first come in to the room, you put your key card into a slot on the wall and presto! the lights all come on. This is extremely convenient. Conversely, when you're leaving your room, you take your key and voila! all the lights go off. Which is also convenient, unless you were leaving your phone or computer in to charge...those plugs also turn off. I came back from my meeting to find my phone almost dead. But that's not a problem as I can charge it while I write this post because my body doesn't feel the need to accommodate a time change for just a few days. Anyways, when I left for my meeting, I walked over to the bus stop. Well, at least I was walking until I saw the bus I wanted drive past me and pull up to the line of people a block away. Then I ran, dodging Danes on the cobblestone sidewalks until I got to the bus. Luckily, I made it on the bus just as the last person in line boarded, so it wasn't like I was causing unnecessary delay. And since my metro pass was good on all city transport, I was feeling pretty comfortable with my travel planning so far. Then I got off the bus a little before I thought I should (I didn't want to go past my stop, since that would have taken me off my map), but I didn't know exactly when my stop would be. Based on the map I had printed out earlier, I could tell the stop I departed the bus from was easily within walking distance to my destination. As it turns out, even my hotel was within walking distance, but the weather was wet and cold and I was tired (so the bus was a completely valid option). But I got off the bus just before a major road that was having all sorts of construction being performed to it, so instead of taking a straight line right along the road I had to zig and zag halfway up several blocks to follow the sidewalk through the construction area. But I made it to my meeting on time. After the meeting, I joined some of my European coworkers in a cab back to their hotel lobby to finish up some preparations for the next day. When I was ready to go back to my hotel, I realized that there were really no convenient public transport options. After checking with my colleagues that the cabs take credit cards, I hopped into one and it took me back to my hotel...where it became clear that I should have asked my colleagues if the credit cards accepted by cabs also required a chip and pin. In a work: Yes. They do. Fortunately, the cabbie allowed me to pay him in USD and give me the change in DKK. So I now have even more coinage and have only been able to use my government travel card for my hotel. This has turned out to be a longer post than I'd planned, so I'll wrap it up here. While it's always good to challenge your assumptions ("they take credit cards nearly everywhere"), sometimes just remembering what you already know ("credit cards" refer to a specific kind of card I'm not carrying) can be more useful than relearning it. One thing I know for sure though, is that the hotel has a breakfast buffet included in the price of the room, now if only I could get some sleep before then.